Novelty acts won't get through Vegas on America's Got Talent. 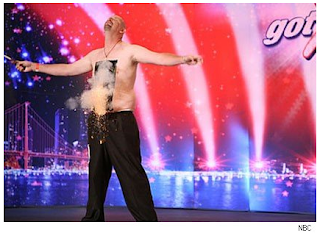 Now the competition on America's Got Talent Season 6 2011 gets serious. It's Vegas Week Tuesday and Wednesday - July 5 and 6. The carnival acts and instant flops are gone. Everyone that made it to Las Vegas will have to prove that they have more than their 90 second audition. Vegas Week presents a new challenge for the contestants. Last year for Vegas Week, everyone will be performing for only the judges and the other contestants - no live crowd to add that extra boost of adrenaline. What each act did in their previous audition is archived and only serves as a baseline of what they are capable of - this week, they will have to show more to the judges. If the show is run the way it was last year, after the performances contestants will be put in three categories - those going on to the next step - Hollywood - those on standby (second chance contestants) - those going home. In all of my posts about America's Got Talent this season, I've stressed that the search is looking for a headlining act for a Las Vegas show, which means they have to have an act that can keep an audience entertained for an hour. If you keep that in mind, you can see who will have a shot at winning and who is destined to be sent home. A perfect example is the Fearless Flores Family. Their family performs on motorcycles in a huge steel ball. As exciting as this may seem, this act has been done on the Las Vegas Strip. It was a segment of the long running Splash variety show at the Riviera Hotel and Casino. Even though the Flores family touts the youngest performers to be attempting these death-defying feats, could you listen to screaming motorcycles for an hour? NO. That is why it was a show element and not an entire show. So, nix the Flores family and their daredevil act. You can trash all the pet trick acts, too. They never go far, usually because they run out of material on the second or third shot. You have to have more than three minutes of cute, entertaining shtick to get you to the next round. Sword-swallowers and other freak show acts that made it through, can them too. Once you swallow a couple swords, you either have to start choking down machine guns, cannon rounds, or household appliances to keep it interesting. Dance troupes have to be phenomenal to go on. Good-bye to the little kids that do the hip-hop dancing. No one in Vegas would pay to see that. Unless your dance troupe can perform on a level of Riverdance, you're another casualty. Several people commented that I had "cracked the code" of America's Got Talent in my last piece - a nice compliment. What I wrote is that the show should be called "America's Got Stories" because the story of the entertainer is nearly as important as their act. The strongest, emotional story will be the deciding factor when fan voting decides the finalists and then a winner. Last year saw incredible finalists with Defying Gravity, Jackie Evancho and Michael Grimm. Grimm had the most heart-wrenching story. He was humble, sincere, and profoundly talented. You could easily argue that for her genre, Jackie Evancho, was light years ahead of Michael Grimm in the talent department, but she lived a nice peaceful life in Pittsburgh and was just waiting for the world to discover her. Grimm had to work his tail off to get where he was and he didn't start believing in himself until the last several performances. Viewers saw that. They also knew he lost everything in hurricane Katrina and he was was raised by poor grandparents. Who needed the million dollars more - the kid that was going to be a star anyway or the guy fighting for his survival? Fighting Gravity faded because there was no story. College kids come up with clever idea. End of story. Listen for the stories and the emotions. I know I'm right, just look at who won The Voice - Javier Colon. He had the most hard luck story. He's a father fighting for a career. He had a record deal that fell through. This was his chance. Dia Frampton was crushing him in iTunes sales after the final performances, but fan voting gave the prize to Colon. And the fans always get it right. America's Got Talent Season 6 2011 goes to Vegas Week Tuesday and Wednesday - July 5 and 6. This is where the stars emerge and the comets flame out and disappear. No, Javier Colon shouldn't have won. Fan's don't get it right sometimes. It's not about the story, it's about the performance. I would pay to see Fighting Gravity because their show is interesting and I can stand to watch them for an hour. I don't want to watch a singer for an hour, it does get boring. If you want to be a singer, join American Idol. Even if you have the most heartbreaking story ever, if you don't have the talent and don't have the skill to have a show in Vegas, the judges won't even vote you through the first round. @Anonymous - You have your shows mixed up. Javier Colon won The Voice - and maybe he wasn't the best. I loved Xenia's voice - it was the most unique and different. The story will win out. A singer for an hour is a concert. People go to them all the time. I would have liked to see Fighting Gravity go somewhere. They remind me of some of what Blue Man Group does and I love them.